It’s a widely known fact that Cape Town is facing its worst drought in history. It’s a subject that has made its way across many international headlines proclaiming Cape Town as the first major city in the world to run out of water. Day Zero has since been pushed out to 2019 but that doesn’t mean Captonians can consume more water. In fact, water restrictions are still heavily in place. Day Zero still looms ahead and, with it, the possibility of queuing for a daily ration of 25 litres of water. As serious as it is, Captonians are tired of hearing about the drought. We wanted to offer a solution that could help them appreciate the water indulgences they’ve been missing, like having a bath, doing their laundry, or taking their car for a wash.
That’s why we launched Water-Smart Getaways – an initiative by MINI in partnership with Getaway that brings you all the guilt-free water adventures you’ve been dreaming of. The MINI Countryman is the perfect vehicle to escape the city, explore and go on an adventure, which is what MINI Water-Smart Getaways encourage. If you find yourself browsing the Internet looking for a holiday break, you might just come across the online campaign. Web banners and social posts direct traffic to the Getaway website where the Water-Smart Getaways are featured. There, you can choose your ideal escape. A series of radio ads on local Cape Town radio stations are also promoting the getaways. In addition to this, campaign mailers were sent to both the MINI and Getaway databases. Getaways give Captonians access to all the things they’ve been missing – flicking their clean hair while walking on the beach, seeing the real colour of their cars again, the sweet smell of freshly washed clothes on their bodies and the relaxing feeling of soaking in a bath until they’re soft and wrinkly, all in a beautiful place they’ve never been to before! Each getaway offers an estimation of how many litres each water-related activity is saving the city. To put things in perspective, a Water-Smart Getaway weekend for two is estimated to save the city around 770 litres of water, multiply that by a couple hundred people and it’s literally saving the city bucket loads of water. If you’ve been looking for an excuse to explore some of the local spots you’ve always wanted to visit, now is your perfect opportunity. Treat yourself to all the water indulgences you’ve been deprived of. Book a trip, get in your car and become a tourist in your own province. Go on! 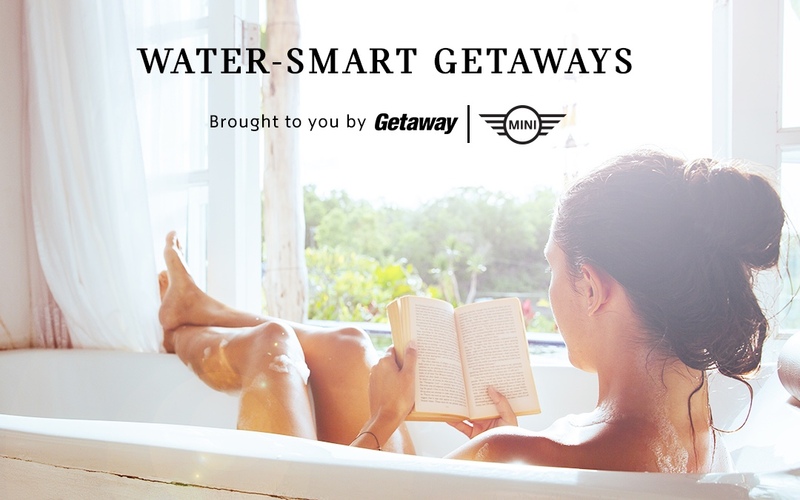 Book your MINI Water-Smart Getaway today!